If you've been following along on instagram, you might have seen this post from when I got to visit Guatemala and found my way to Pixan House in Quetzaltenango. Pixan is an organization of indigenous weavers and designers in Guatemala, a sister program to the Highland Women's Association. If you've been following along with Fashion Revolution, you might have seen a lot of incredibly interesting and important dialogue around what it means to be "sustainable" and "ethical". In particular, the words of French Malian dyer Aboubakar Fofana in his series of instagram posts on the topics of "fair" trade and colonialism stuck out to me. He talks about the way that often Western designers use artisans in 'developing' economies as a way to appease their own guilt, often at the expense of the artisan and their communities, and ultimately leading to more wealth disparity. This is why organizations like Pixan are so crucial. Pixan is direct trade - not fair trade - (which can be prohibitively expensive for smaller organizations), they work directly with indigenous highland weavers, and they are staffed and run by Guatemalan women. Formed as a reaction to the civil war which occurred in Guatemala in the 1960s, the organization aims to support and sustain indigenous women living in the highlands. Doing trade in a way that is truly fair to all parties involved is certainly not simple or easy, but I feel excited and hopeful as I introduce you to Pixan. 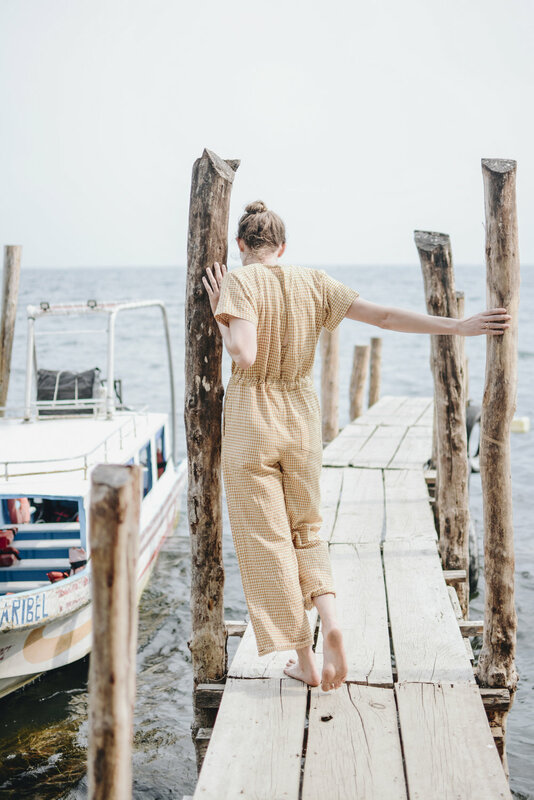 They've recently launched an Etsy store as a way to gain a wider audience for their beautifully-made cloth goods, most of which are naturally dyed with local plant materials and all of which are hand woven by artisans in Guatemala. I'm especially stoked to tell you that the jumpsuit they custom fit for me is now available on their Etsy, too! (and it comes in 3 different colors! - I kind of want another!) It's 100% cotton and the most comfortable thing on the planet. And as a special thanks to my patreon supporters, folks who are donating $5+USD/month are getting a discount code sent to them shortly - this code is good for your first purchase with Pixan, so if you'd like a discount on your jumpsuit purchase, access to additional content from me, and future discount codes, you can become a patron here.